Increase efficiency and accuracy by pairing scanning technology with your inventory solution. Using Barcode and Radio-Frequency Identification (RFID) technology makes inventory control faster and more accurate. Barcodes and RFID tags help keep track of your inventory, reduce errors, and eliminate the cost of manual record keeping. Clear Spider incorporates the use of Barcodes and RFID tags to communicate updates on the status of your inventory directly to you. Here are just a few of the ways that our clients use Barcode and RFID scanning in their inventory management solutions. Barcodes are a printed image that can be scanned by a reader. It is usually a series of lines and numbers that represent a code. Barcode tags are less expensive than RFID, but the scanner must be held close to the barcode and each tag must be scanned individually. Through the use of Clear Spider technology and 2D Barcodes (QR codes), you can record transactions and scan items using your smartphone camera. Our app is optimized for medium to light scanning with regular smartphone cameras. Scanner add-ons can be used to accommodate higher frequency scanning. An RFID reader can scan a product by waving the device in a general direction of the tag. 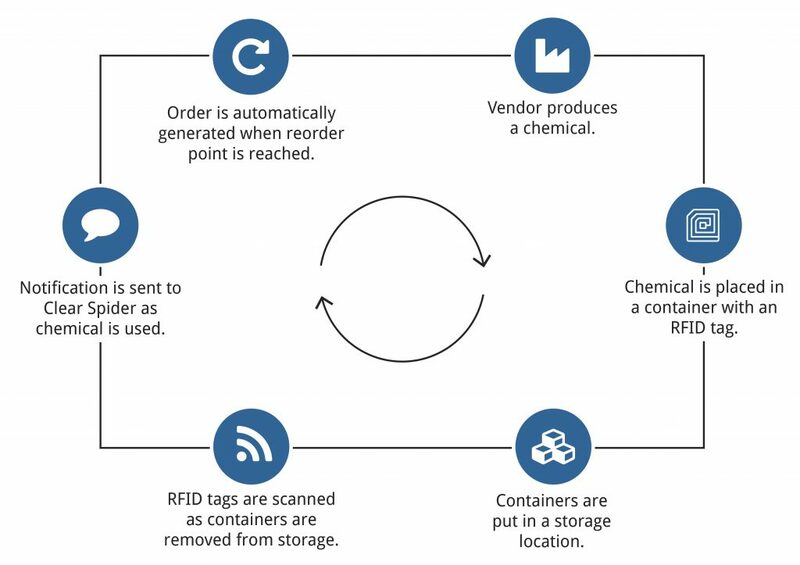 The reader picks up the RFID tag using radio wave signals, giving the reader a significant amount of product information, such as the expiry date or product maintenance details. RFID tags contain embedded data and are therefore more expensive to purchase. It’s quick and convenient to scan several RFID tags at once or in batches when they’re in the same room or area. It’s less cost-effective when there are multiple items spread out over several locations, with only one or two items per location. Accuracy Very accurate, and can be read on many types of surfaces RFID tags are fairly accurate. Some tags cannot be read through metal or liquid containers. Tags may have trouble responding if a large number of them are scanned at the same time. Need help finding the right scanners for your organization? Here is just one example of how your business could use Clear Spider’s RFID tags. In this same situation, the business could use barcodes (instead of RFID) and have employees scan the container when they remove it from the storage area.